In 2010, the Saatva Company set out to build a luxury mattress that anyone could afford. More than that, they wanted to create a buying experience that was simple, stress free and satisfying. Saatva claims to be America's best priced luxury bed. We break down the hype and and show you how Saatva measures up. ​Lower Support Coils: Tempered steel 13 lb. innerspring is much heavier than most mattresses made today. To put it in perspective, most companies use between a 14.5 - 15.5 lbs. coil unit. When it comes durability, that difference is significant. This reduces how quickly the mattress will sag and lose its support qualities. 14.5 lb Individually Pocketed Coils rest on top of the bottom support springs. They provide additional structure, body conformity and airflow. They also decrease motion sensation which is great for couples. Not feeling your partner's movements as much is a primary concern for many. It's worth noting, these secondary coils are as heavy (or heavier) a gauge as most primary coil units. Many companies who tout dual coils units use light weight, 16 - 17 lb micro coils on the top. Although these units do increase airflow, they do little in the way of additional support. By comparison, Saatva's dual coil system rivals support much more expensive luxury models. 3​" of Bio-Based foam makes up Saatva's cushion. Approximately, 30 - 40 % of the polyurethane is removed and replaced with eco friendly plant based material. The core provides solid, if not spectacular support. Saatva's Organic Cotton Cover is soft to the touch and breathable. This environmentally friendly fabric adds comfort and durability. Most pillow tops that are sewn to the top of the mattress. Often times this causes shifting of the cushion and irregular wear. 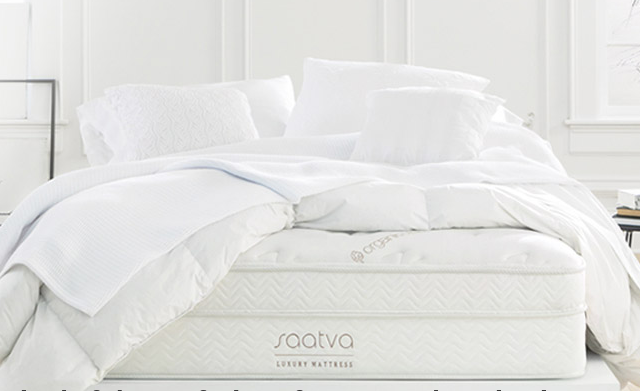 Saatva inserts the foam directly under the cotton cover. 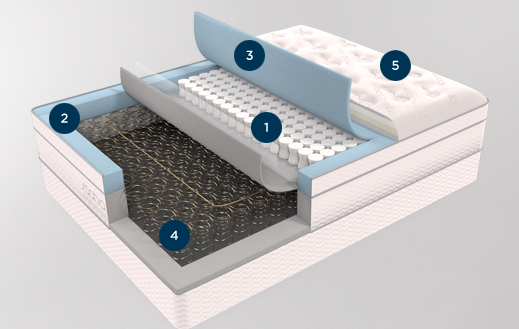 This results in the mattress maintaining it's shape and comfort for a longer period of time. ​Saatva adds a thin layer (5/9th of an inch) of 3.5 lb density memory foam across the center 3rd of the mattress. It's designed to provide additional pressure relief and stress on the lower back. This thickness and density most likely does not have a huge impact on the overall comfort feel but should make a just noticeable difference. The outside edge of the upper coil is foam encased. This adds 3' extra edge support foam and creates a larger sleep surface. 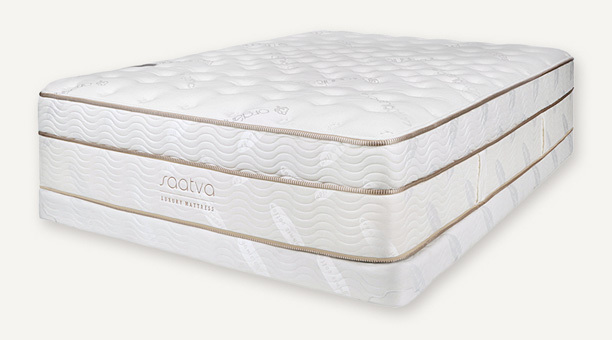 Saatva contends this is a feature found ​only in the best quality mattresses. Although we agree it is an advantageous feature, it's not a unique or new idea. Foam encasement has been commonplace in the bedding industry for many years. A more recent feature used in quality bedding is to add perimeter coils around the edge. This creates an even more substantial edge that feels consistent with the rest of the bed. Three different comfort levels means greater possibility of finding the feel that's right for you!​ The support is identical in all three mattresses. Softness level is adjusted by changing the density of the support foam. Although Saatva tells us specific densities are proprietary, they did say the range of all three was between 1.5 lb. and 1.8 lb. The denser the foam, the firmer the mattress. An adjustment is also made in how taut the cotton cover is stitched. Again, tighter stitch means a firmer feel. Firm is the best option for back and stomach sleepers who desire the most ridgid sleep surface available. It's important to note, all three mattresses have the same support. A mattress that is too firm can cause pressure points and pain. Unless you are absolutely set on obtaining the firmest option available, we recommend choosing the Luxury Firm. Luxury Firm: This mattress is typically an ideal level of firmness for most back, stomach and some side sleepers, Soft enough to lessen pressure points but firm enough to maintain proper alignment. Soft: The Soft is the bed of choice for the majority of side sleepers. It allows for greater conformity and pressure relief for the shoulders and hips. Saatva's 14.5" mattress will not work with an adjustable base. However, the company has introduced an 11.5 inch option that is fully functional for this purpose. Both mattresses maintain the same comfort feel. The only difference is found in the bottom support coil. 2 turns (or 3") of coil are removed to allow for greater flexibility. The mattress serves a dual purpose. It also accommodates those who simply want a lower profile mattress. Price reflect both the 14.5 or 11.5 mattress. Saatva is a luxury mattress that can not be rolled into a box. A full service delivery including setup and removal of your old bedding is available. Cost varies by location. See Saatva.com for details. Saatva offers a 120 day Comfort Guarantee. If you do not love your mattress, return it free of charge less the original shipping fee. Saatva has compared itself to Beautyrest Black; stating that is comparable quality for half the price. The triple wrap, tempered steel Simmons offering is a proven winner and takes a back seat to very few mattresses. It's hard to draw a true comparison because their respective coil units are so distinctively different. That said, Saatva's coil system is good enough to at least be mentioned in the conversation. Their foams however, do not necessarily measure up with higher priced rivals. 3" of polyurethane and ​plant base material is not an exceptionally inspiring foam if you want to compare yourself to high end luxury mattresses that use natural latex or high density memory foam. However, it is more than adequate to provide decent comfort and support. Combined with an exceptional coil on coil innerspring and organic cotton cover, Saatva is a great value for the dollar. Saatva's dual coil support is easily the best innerspring we've reviewed under $1,000. The 13 lb. base coil gives superior support. The individually pocketed 14.5 lb coil decreases motion detection and alignment. The two combined create awesome airflow that helps keep you cool. Three Comfort feels: Firm, Luxury Firm and Soft. Just the right feel for everyone! Service Is Amazing! From Saatva's friendly and knowledgeable online attendants to their no nonsense return policy. An overwhelming majority find the overall experience enjoyable. Price: For the dollar, Saatva is an exceptional value! Eco Friendly materials: While not an "organic" mattress, we applaud Saatva's dedication to reducing the size of their carbon footprint. Eco friendly materials like bio-based foam and Organic cotton are a step in the right direction. A small number of issues have been reported of shipping delays and scheduling problem. These issues generally get resolved satisfactorily. If you like sleeping on a memory foam bed that allows your body sink into the mattress, this bed may not be for you.Like all traditional innersprings, you sleep on top of the Saatva. It's a matter of personal preference. Is Saatva right for you? No one mattress right for everyone. How impressed (or unimpressed) ​a consumer may be with the overall quality of a bed largely depends on how comfortable they are. Sleep position preference, physical condition weight and age all play a part what determines individual comfort. Depending on your physical make up, two different people laying on the same mattress could interpret the firmness of a mattress completely different. For the best odds of success, read our comfort options information on this page. The mattress is very comfortable - great customer experience. The only problem I have is the mattress doesn't have any handles to pick up the mattress when you need to turn it or to put sheets on. Living alone, it makes it very difficult to do either of those things. A note about the "firm"
Overall, great experience. Very happy with my mattress. I originally ordered the 'luxury firm' based on the recommendation of Cody who was very helpful on chat. However when I slept on it initially, I found it to be too soft and it hurt my back. That situation improved after a few nights, but I still wanted a firmer bed, so I did an exchange that went very smoothly. If you think you are someone who wants a very firm mattress--the type they have in hotels in Asia, for example--I'd go with the FIRM. Put this way: I don't think anyone would call the 'luxury firm' a firm or very firm mattress. It's kind of a typical firm-ish bed. If you are one to seek a firm bed, go with the FIRM. I purchased my mattress about five months ago. It sleeps great and my only complaint is that I purchased the 14" and it's extremely heavy and cumbersome to lift when I change my sheets. In retrospect, I wish I had gotten the 11". Like many others, I hesitated to order a mattress on the internet. However, I have to say I am very pleased with the quality of the product and the very good customer service. I ordered the Luxury Firm, and it is indeed "just right," not too hard and not too soft. A very good buying experience, and the price is an incredible value. I spent months research the different mattresses available. After almost buying a tempurpedic memory foam mattress, I opted for Saatva based on all the positive reviews online. I've had the luxury firm mattress for about a week now and all I can say is WOW. Some of the best restful sleep I've had in year. I suffer from a herniated disc between L5/S1 so back pain is daily struggle but this mattress really takes the pressure off. I'm a side sleeper and have not experienced any problems with my limbs falling asleep so far. I'll update this review again a few months from now to see if I still feel the same about this mattress. So far, so good.